Glasshouse Rocks are perhaps the most fascinating of Narooma's many natural wonders. Beginning at the southern edge of Surf Beach, they continue to the northern end of Handkerchief Beach. There are three ways to reach them. The first, and the recommended access, is via Glasshouse Rocks Road, through the Industrial Area to the Cemetery; at the southern end of the cemetery is a path down the cliff to the beach (bit difficult to find but worth the effort to reach the most secluded stretch of beach on the coast). The other two ways are from Surf Beach and Handkerchief Beach, both have decent parking for your car, and pleasant beach walks, but when you reach the rock formations, both are better attempted at low tide - they can be dangerous. The geological title of the rocks is 'The Narooma Accretionary Complex and Chevron Folds' and they are over 500 million years old. This image belongs to the travel and nature stock photo library. This stock photo of Glasshouse Rocks is available for licensing for commercial and editorial uses including websites, blogs, books, magazines, brochures and advertising. Restrictions may apply for images which contain third party copyrighted material or sensitive subjects. Photos of artwork are for editorial use only. 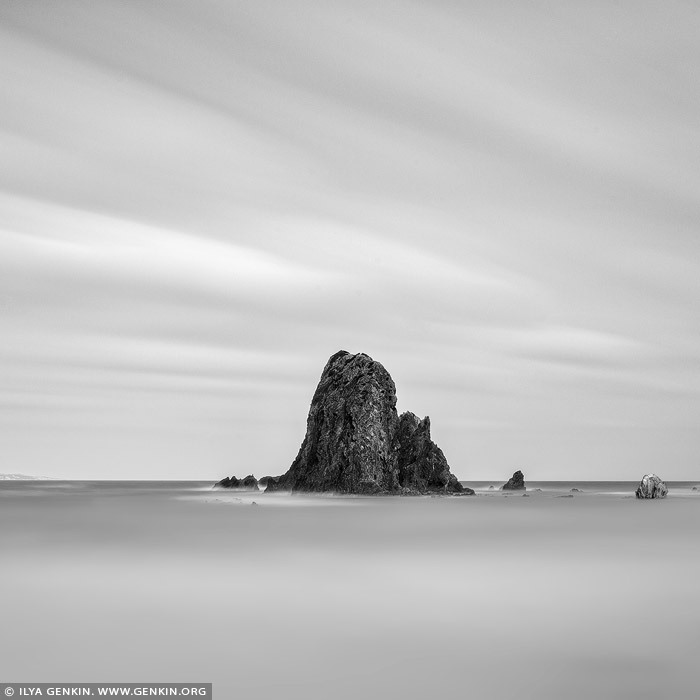 This image id AU-NAROOMA-GLASSHOUSE-ROCKS-0002 of Glasshouse Rocks, is copyrighted © by Ilya Genkin. This is not a public domain image.